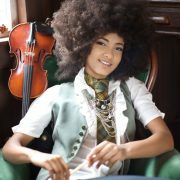 Bassist and singer Esperanza Spalding has received a great deal of exposure in the last year or so, making appearances on network TV shows and recently stealing the Best New Artist Grammy from under the little nose of Justin Bieber. This coming Friday and Saturday night, she’ll be performing for another decidedly non-jazz audience when she opens for pop star Prince at the Forum in Los Angeles. Prince is in the midst of what has been called a “residency-style concert series” tour, replete with smaller venues and guest appearances. His “Welcome 2 America” tour, includes a 21-date stand in Los Angeles that started on April 14 at the Forum. Among previous opening acts on this tour have been Cee-Lo Green, Janelle Monae, Sharon Jones & the Dap Kings and others. Spalding, along with singer Cassandra Wilson, are the only jazz acts to get the nod. Her current album, Chamber Music Society, is currently at No. 2 on Billboard’s Contemporary Jazz Albums chart. Performing with Spalding will be her former employer Joe Lovano on saxophone, Jef Lee Johnson on guitar, Raymond Angry on keyboards and Terri Lyne Carrington on drums.